I know I should never read the comments sections of news sites because they are, as I have often said “where the lowest scum settles.” For some reason, news websites attract the most vicious, looney, racist segment of society. And I guess, why not? It’s not like they’re busy doing anything productive. A child is dead and someone uses the occasion to make fun of Black People and Their Funny Names. A family weeps and the best thing someone a thousand miles away can think to do is to make fun of their son’s name. Because he’s black, and his name is, what too creative or something? I wonder if he were white and his name was Cadyn or Jasyn or Kole or something, would that be as funny? What if he were white? And what if the man patrolling the neighborhood with a gun and following children were a 28-year-old, 250-pound black man? Would he still be walking the streets, even if he had never shot anyone in cold blood? No, no he wouldn’t. Because big, armed black men are scary and dangerous, and big, armed white guys are apparently just defending the neighborhood from the peril of skinny boys going to the corner store for some candy and an iced tea. I’m disgusted. I’m horrified. I’m especially ashamed at myself that it took someone else pointing out how different things would have been if the races were reversed for me to start thinking about it. Thanks to the people who keep reminding me I need to examine my hidden beliefs about stories like this. I need reminders and I need help. I just hope there’s a day where we all can come to the point of knowledge and sanity so that no one thinks it’s ok to make fun of a child’s name while he lays dead with a gunshot to the chest. What’s at least as bad is that at some press conference when Trayvon’s mom (I think it was his mom) was answering questions about what he was like, one of the reporters asked if he liked chicken (http://bit.ly/FQdCFq). Anyway, I agree – and I used to make fun of “silly” names like Trayvon in my youth. I’d begun to try to let it go a long time ago, but it got easy when I had kids and they started asking things like “Who invented the name Bill?” And when you think about it, Bill doesn’t make any more sense than Trayvon so it made it easy. As far as online comments go, I’ve pretty much had to abandon reading or contributing to most of them. I either lose faith in humanity or get sucked into some internet feud that’s pointless anyway. The newspaper actually clarified the chicken thing. Apparently his mother had brought it up first and the reporter was fact-checking, but the first exchange got cut from the tape. I guess enough people were pissed that they decided they had to say something. Yes, I made fun of funny names too, until I grew up. I am hoping the person in the comment section wasn’t an adult, but I bet they were. I can’t wrap my head around 1) why this guy is not in jail and 2) why there are not MORE people (all the people) standing up and calling for his arrest. Apparently FL has a law where all you have to do is say “Oh, hai, self-defense” and they let you shoot people. Remind me to never vacation there. This saddens me so much. As the mother of a young man just five or so years older than Trayvon, I cannot imagine the grief and the loss his mother and father must be feeling right now. How sad is it – we parents teach our children to beware of strange men on the street who may stalk them in cars – we teach them to run, to shout, to fight to get away. 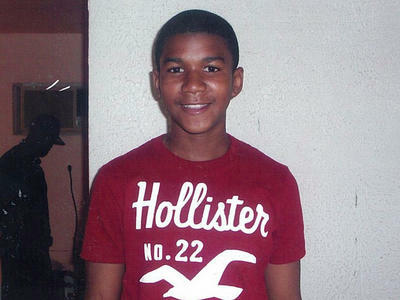 Trayvon must have been in so much fear in his last moments. I have deliberately avoided sites that I think might have horrible comments. It’s too awful. The picture slays me. He is just such a…boy. A kid. With a big smile. A kid. i haven’t been following this closely, but everything i’ve seen makes me question why he’s not in jail as well… most especially the transcript of the non-emergency call he made to the police where the dispatcher told him NOT to follow the suspicious person. everything i’ve read makes him sound like an overcompensating loon. Overcompensating loon is about the best description I have heard. This whole incident is just heartbreaking. I have two adolescent sons, and it has prompted a lot of discussion in our home. They just cannot wrap their minds around the whole thing. Sometimes there is no satisfying explanation, sometimes horrible things happen to good people for no good reason, sometimes justice is not served – hard things for them to hear. Trayvon did everything we teach our children to do – a strange man was following him, so he ran; when he was confronted, he fought for his life. Chasing a young man down and shooting him because you think he is the wrong color to walk down the street in your neighborhood should preclude you from claiming self defense. I hadn’t thought about the opposite scenario either and I agree – some self-examination is required. I saw this statistic once about missing woman. I can’t remember exactly what it was but the issue was that when a white woman goes missing all the news affiliates cover it, but you never hear about the non-white women that go missing every day in this country. The story made me so angry. A missing girl is serious business no matter what color she is! This story? Same thing. That poor family. Horrible. There’s no excuse for those nasty commenters. None. My own cousin posted a link to FB – an article from “The Examiner” where the author doesn’t understand why people don’t see the other side of this. (that poor man who ignored the 911 operator instructions not to follow Trayvon was apparently getting beat up and had the “right” to defend himself. I unfriended him. I’m too embarrassed by his ignorance (he is a father of 2) to even VIEW his opinions going forward.